“In cold climates, the greater the exposed surface area, the greater the loss of heat and therefore energy. Animals (including humans) in cold climates need to conserve as much energy as possible. A low surface area to volume ratio helps to conserve heat. In warm climates, the opposite is true. An animal will overheat quickly if it has a low surface area to volume ratio. Therefore, animals in warm climates will have high surface area to volume ratios so as to help them lose heat. 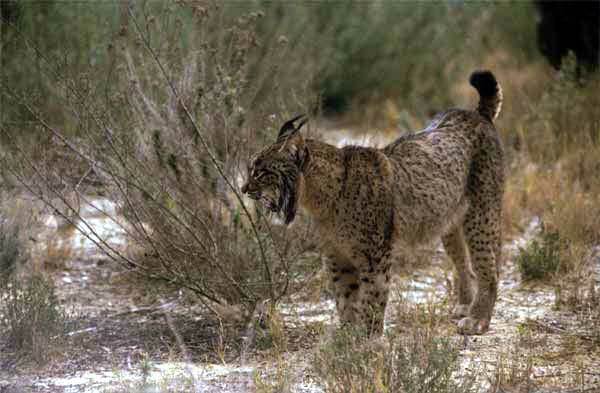 Given that the Eurasian Lynx is much larger than the Iberian Lynx, also perhaps applicable is Bergmann’s Rule which “correlates environmental temperature with body mass in warm-blooded animals. It asserts that within a species, the body mass increases with latitude and colder climate. Among mammals and birds, individuals of a particular speciesin colder areas tend to have greater body mass than individuals in warmer areas. ” This is no doubt the case further north and when comparing areas with similar levels of rainfall, but also coming into play is the the extremely limiting factor of the Mediterranean summer drought, which also tends to reduce body size. There simply isn’t as much prey in the Mediterranean summer. Top, a Eurasian Lynx, bottom Iberian lynx. Not sure if these pictures do justice to my idea.